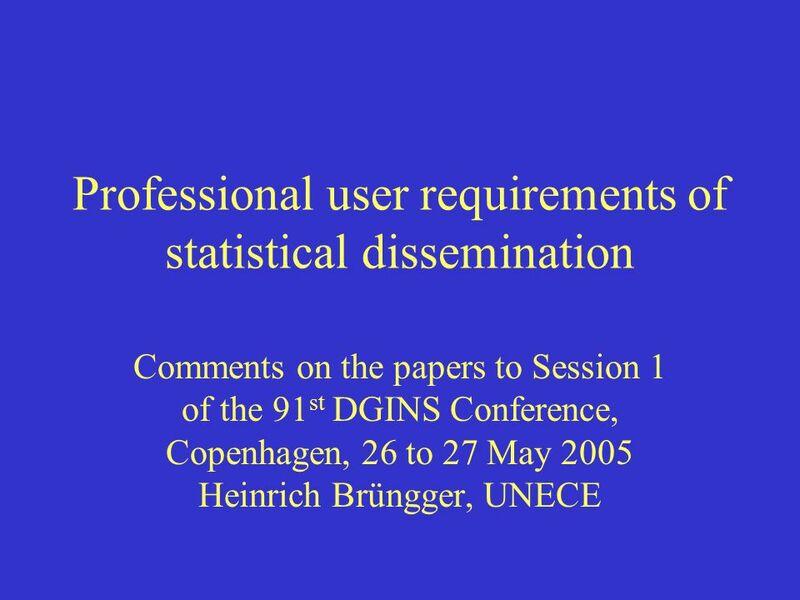 Professional user requirements of statistical dissemination Comments on the papers to Session 1 of the 91 st DGINS Conference, Copenhagen, 26 to 27 May. 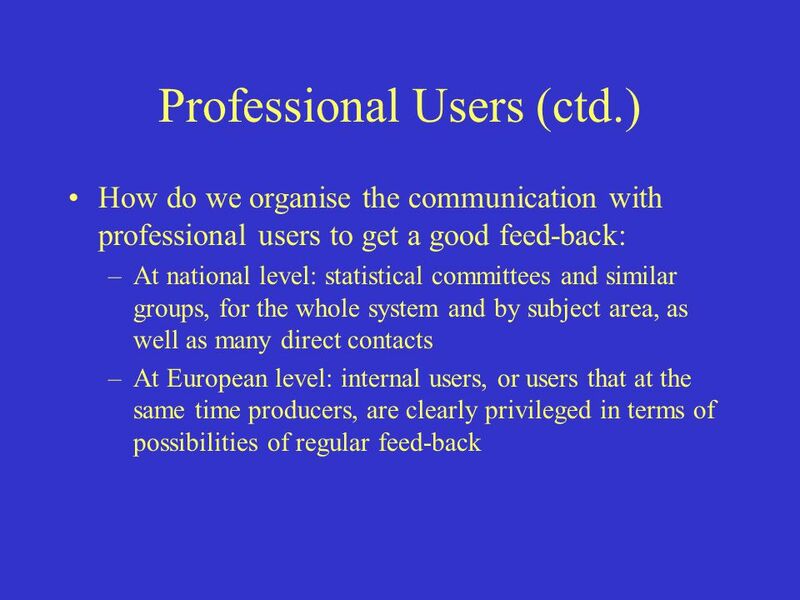 2 Professional Users In what way is dissemination to professional users different from the dissemination to non- professional users? –Less or no metadata? 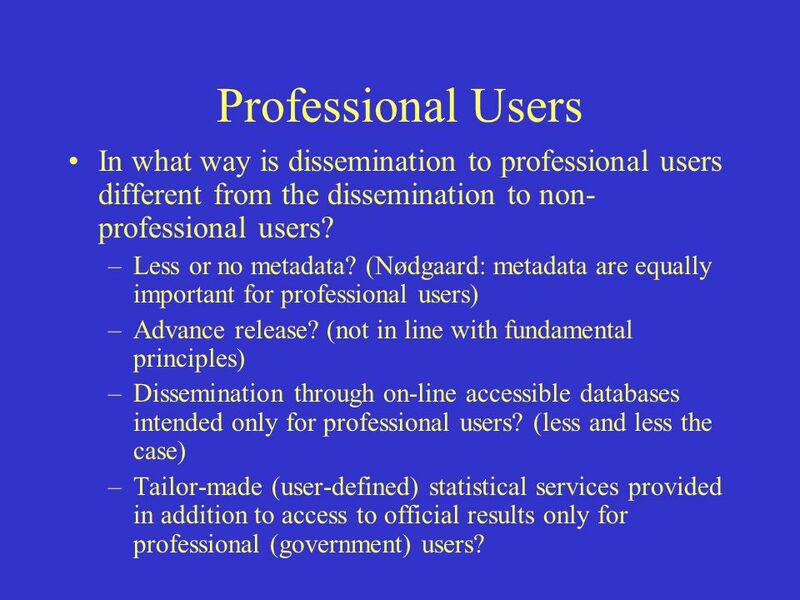 (Nødgaard: metadata are equally important for professional users) –Advance release? (not in line with fundamental principles) –Dissemination through on-line accessible databases intended only for professional users? 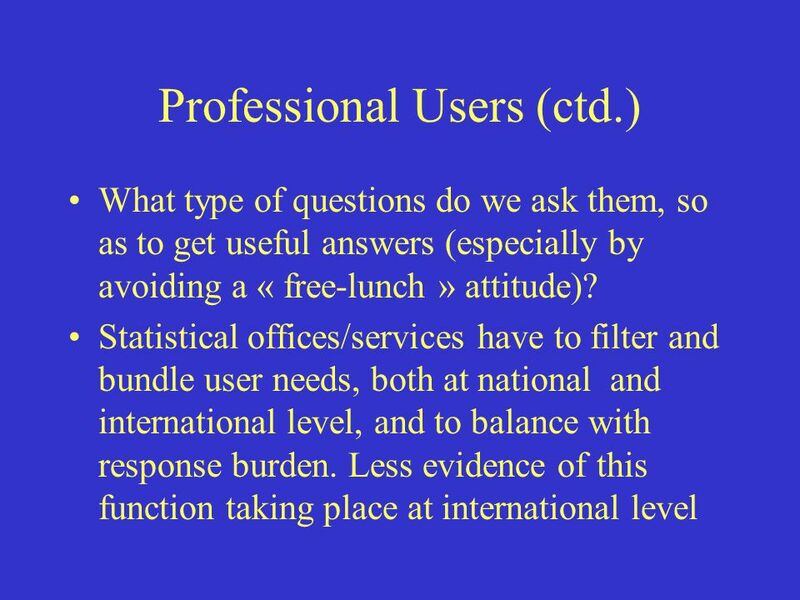 (less and less the case) –Tailor-made (user-defined) statistical services provided in addition to access to official results only for professional (government) users? 10 International Statistics (ctd.) Should we introduce a comparability scale for intercountry comparisons to guide users? Should we have more external assessment of data work in international organisations, and more benchmark exercises? 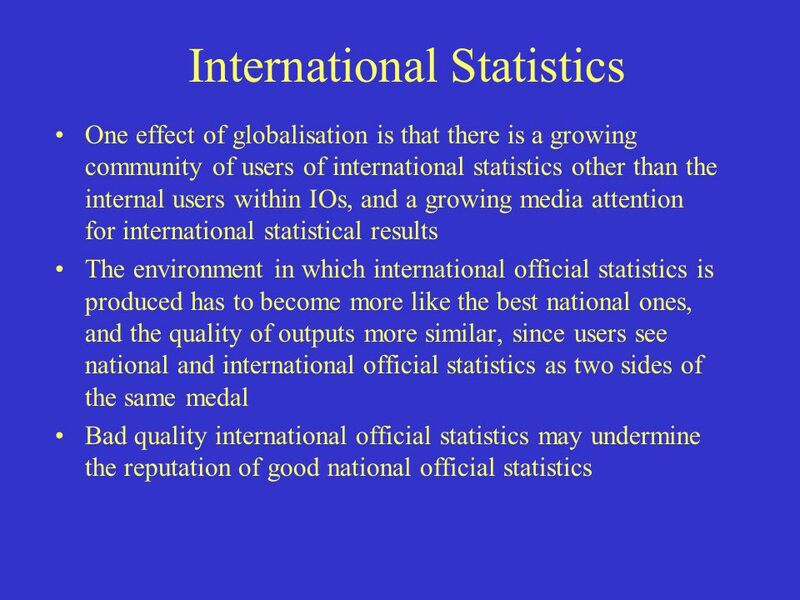 How can we stabilise the production and dissemination of international official statistics? 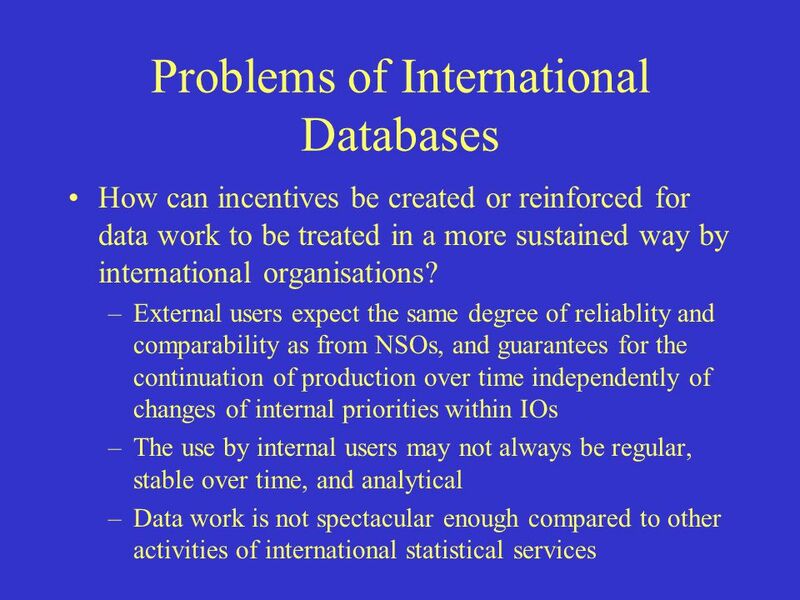 How can we increase the authoritativeness of international statistics, given that the variety of different series and results, and the number of actors, is much greater than at national level? 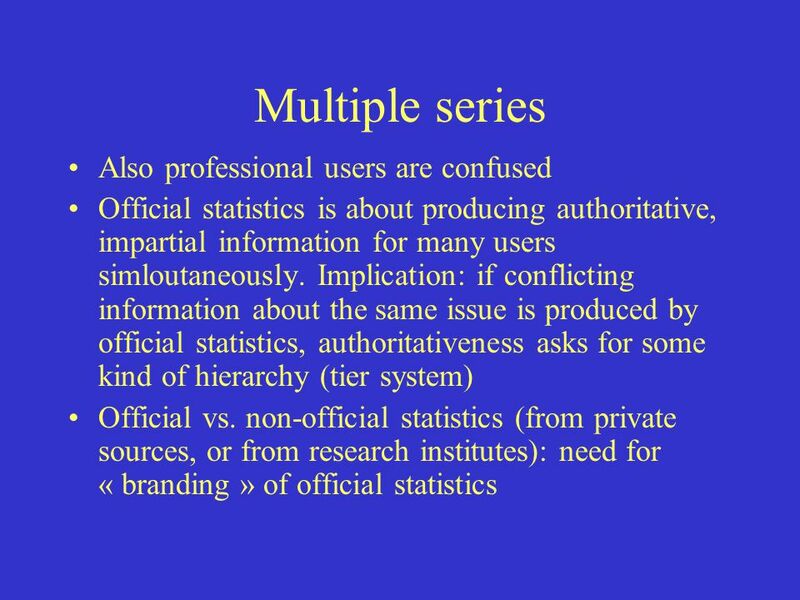 11 International statistics (ctd.) 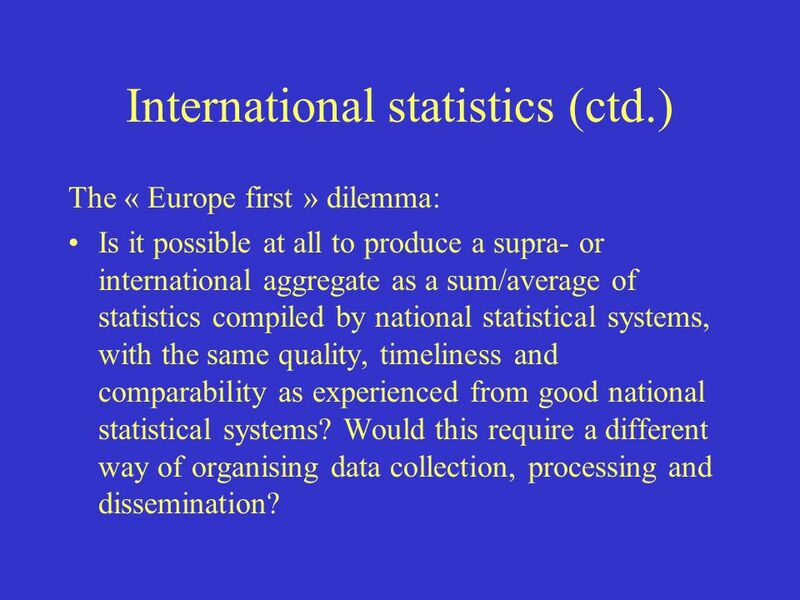 The « Europe first » dilemma: Is it possible at all to produce a supra- or international aggregate as a sum/average of statistics compiled by national statistical systems, with the same quality, timeliness and comparability as experienced from good national statistical systems? Would this require a different way of organising data collection, processing and dissemination? 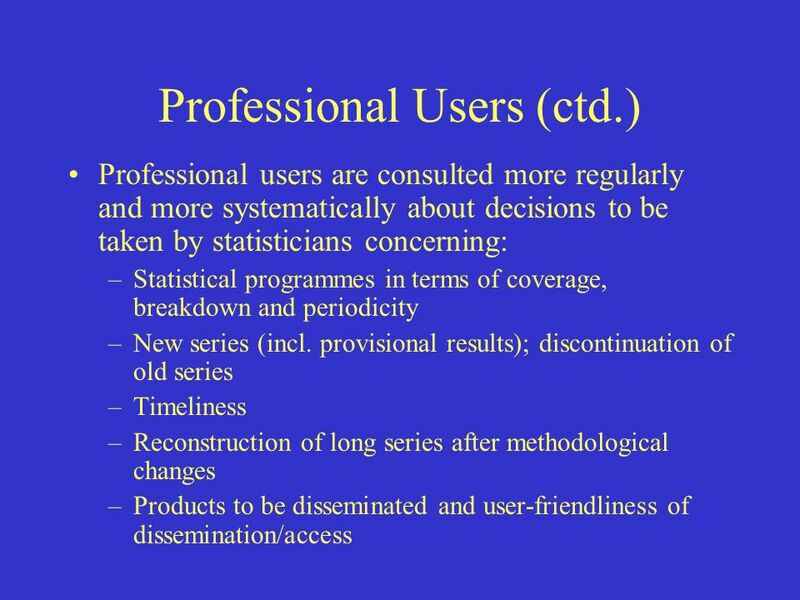 Download ppt "Professional user requirements of statistical dissemination Comments on the papers to Session 1 of the 91 st DGINS Conference, Copenhagen, 26 to 27 May." 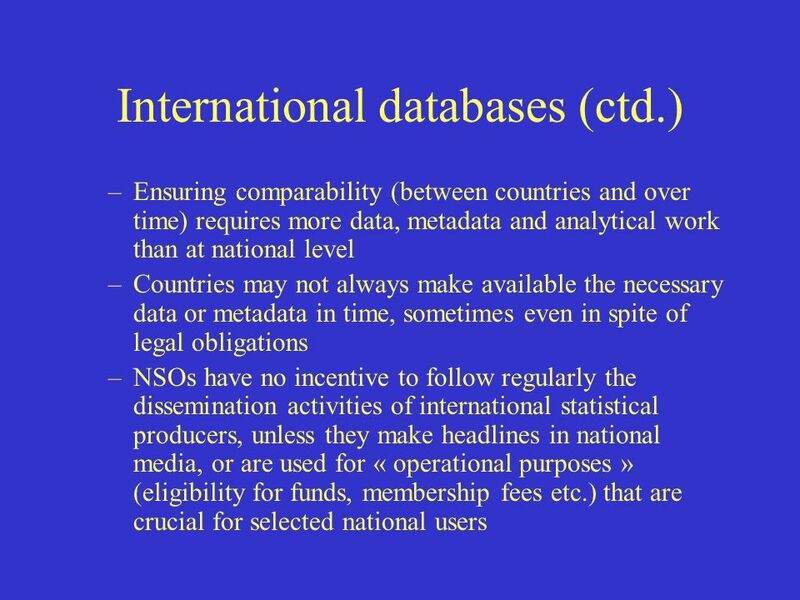 Best practice for ensuring quality in international statistics - The Principal Global Indicators - Werner Bier, Per Nymand-Andersen European Central Bank. HIGH OUTPUT QUALITY MONITORING VIA THE ECB QUALITY REPORTS ON STATISTICS Pedro Abad Banco de España European Conference on Quality in Official Statistics. Quality initiatives taken at Statistics Mauritius Presented by S. Cheung Tung Shing, Principal Statistician. The Danish statistical system - experience of coordination Lars Thygesen & Kirsten Wismer. United Nations Economic Commission for Europe Statistical Division UNECE Training Workshop on Dissemination of MDG Indicators and Statistical Information. News media requirements of statistical dissemination Dr. Peter Pukli President of Hungarian Central Statistical Office May, Copenhagen. Safeguarding trust in Irish Official Statistics A Code of Practice for the Irish Statistical System Pádraig Dalton Director General Central Statistics. The quality framework of European statistics by the ESCB Quality Conference Vienna, 3 June 2014 Aurel Schubert 1) European Central Bank 1) This presentation. Safeguarding trust in Irish Official Statistics A Code of Practice for the Irish Statistical System Ken Moore, Central Statistics Office European Conference. Principles of Analysis and Dissemination Country Course on Analysis and Dissemination of Population and Housing Census Data with Gender Concern October. UIS Data gathering mechanisms Said Voffal Kampala, 6 May 2008. The use and convergence of quality assurance frameworks for international and supranational organisations compiling statistics The European Conference. Sub-session 1B: General Overview of CRVS systems. Culture Programme - Selection procedure Katharina Riediger Infoday Praha 10/06/2010. PART II – Management Audit: Basic Standards, Values and Norms Shared by Pratap Kumar Pathak. CZECH STATISTICAL OFFICE Na padesátém 81, CZ Praha 10, Czech Republic Strengthening Statistical Capacity to Improve MDG Data in Conditions. Quality assurance activities at EUROSTAT CCSA Conference Helsinki, 6-7 May 2010 Martina Hahn, Eurostat. 1 Legal foundations and institutional arrangements on Energy statistics in the Republic of Azerbaijan Yusif Yusifov, Head of division Industry, transport. 1 1 Resources and Funding of Official Statistics Olav Ljones SADC Work Shop 2- 6 Dec 2006, Luanda.